All too often, I catch glimpses of women with unknowingly smeared lipstick and raccoon-like eye makeup on the street. Hey, it happens — but it doesnâ€™t have to! As a makeup artist for Good Morning America, itâ€™s my job to make sure the anchors and reporters look perfect from the showâ€™s start to finish. With those hot studio lights and high-pressure scenarios, itâ€™s a challenge to make their makeup smudge- and budge-proof. Over the years, Iâ€™ve learned a few tricks that really work. With these following tips, youâ€™ll look flawless for hours. Finding the right foundation that wonâ€™t look caked-on after a few hours is essential. The best product depends on your skin type. Experiment with drugstore concealers to find the right one. Sephora-brand concealers are also dependable. They come in a variety of shades for all skin tones and rarely require reapplication throughout the day. I like how they sink into the skin, leaving a nice, natural look. Creased, smudged eye shadow is one of the biggest beauty blunders I see. But one simple step can prevent this from happening: First, prime your lid with concealer. Without a primer, the makeup has nothing to hold onto — and the natural oils in your skin will cause it to slide off and crease. 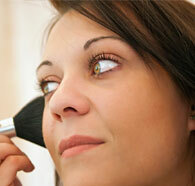 So gently dab a little concealer onto your eyelid before applying any eye makeup. Brooke Glaser is a celebrity makeup artist who also works on â€œGood Morning America.â€ For more tips and tricks, visit her website, BeautyByBrooke.com.